I don’t bill myself as a medium, but I have had some remarkably clear messages from spirit as I was beginning to fall asleep, in that in-between sleep and awake state. Lately, I have been working on extending that state of mind as I wake up, to stay in that theta state as long as I can and see what information I can receive. It may take you a while to achieve the theta brainwave state while awake, but keep meditating and write down in your psychic development notebook any experiences you have as you fall asleep, or wake up. Keep a dream journal during your time of psychic development, as this is one of the easiest way psychic information can come through to you – in your dreams. Delta brainwaves happen in deep sleep. People awakened at this stage of sleep remember no dreams. This is the stage of sleep where our bodies are restored and repaired. As we age, we spend less and less time in this stage of sleep. When we are babies and children, we spend a lot more time in this deep sleep. From everything I’ve read, no one remembers any messages or dreams from this brainwave state, so it is probably not helpful in regards to psychic development, but, obviously, very important to our bodies. Another stage of brainwave activity is called high beta. This happens at the higher cycles of beta at 18 to 40 Hz. This is when you are totally focused on what’s going on in front of you and feel like you are ‘in the zone.’ In this state you seem to instinctively know what’s coming next. For years, I worked in restaurants as a server or bartender, and had many a busy Friday night, where I was just completely tuned-in to all the dozens of tasks I was juggling in my mind. In that mental zone I had impeccable timing and got everything done accurately and with excellence. Another example of high beta is during sports, when an athlete is able to be in the right place at the right time to make incredible plays, over and over. When asked about their performance the athletes will tell you they just felt really focused and in the zone. I’m sure this applies to working in emergency rooms, being a first-responder to crisis situations, combat and other wartime activities. Even a mother of several small children experiences this as she is taking care of them. A million things may be going on at once, yet mom smoothly and efficiently handles everything, including miraculously avoiding small disasters. During high beta, there is no consciousness of a message coming through, but rather your body instinctively knows what to do or to prepare for something that is about to happen. I can remember from my waitress days absentmindedly grabbing a towel and heading toward a table, only to have someone at that table knock over a drink just as I arrived! As I quickly mopped it up, I recall the guests asking, “What are you, psychic?” and in that moment being just as baffled as the people at the table as to how I knew to come over with a towel at that exact moment. There was no conscious thought or spiritual message at all. It was like my body knew, but my mind didn’t. If you want to develop this type of ability, I believe you would need to practice mindfulness in some kind of moving mediation, rather than sitting still. I would suggest Tai Chi or martial arts training, where you repeat physical activities over and over with complete mindfulness. My version of this was to practice throwing different pitches over and over, two hours a day at a bounce-back pitching device, from the ages of 11 to 13. I believed at the time I could become the first female Major League pitcher. I never did, but it did develop my ability to concentrate and become completely aware of everything that is going on around me. For the purpose of developing your psychic senses, though, this kind of meditation is not necessary, especially if you just want to be able to read for yourself or others. The right and left hemispheres of the brain also relates to psychic ability. If you would split the brain right down the middle, into two symmetrical, or equal parts, you would have a right and left hemisphere. Although equal in size, these two sides are not the same, and do not carry out the same functions. The left side of the brain is responsible for controlling the right side of the body. It also performs tasks that have to do with logic, such as in science and mathematics, language and speech, as well as our perception of sequential, linear time. It notices details, and it labels, organizes and categorizes things. The right hemisphere coordinates the left side of the body, and performs tasks that have do with creativity, intuition, emotions, the arts and spatial relations. The left brain processes details, while the right brain sees the big picture or holistic viewpoint. Interestingly, if you are left-handed, then you reverse this, except of course, the controlling of opposite sides of the body. Both hemispheres are connected by the corpus callosum and communicate back and forth in most activities. So, for example, in a reading, even though I access the right side of the brain to get intuitive information, I have to use my left side of the brain to translate and communicate what I’m getting. If I’m drawing a picture, I access the right side for the artistic, spatial ability, but also the left side to control my right hand to draw it. 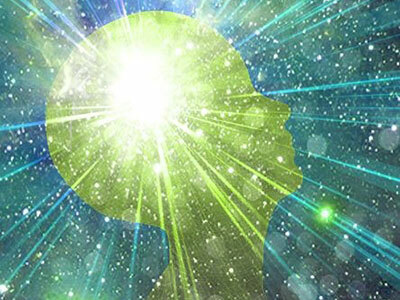 When I am teaching psychic development to students, I have noticed that people who are more in touch with the right side of the brain have an easier time in the beginning with their psychic development. Often the people who work in very logical, left-brained jobs, such as engineers, get very frustrated with the process as it feels so foreign and unnatural to them. They tend to want step-by-step instructions, similar to the order of operations to solve a mathematical equation. Unfortunately, psychic information doesn’t work that way. It seems to come when you are just ‘letting it in.’ But I have found some things that will work if you give them a chance. The first thing you want to do is build your right-brain ‘muscle,’ so to speak. So obviously, ‘touchy-feely-warm-and-fuzzy,’ as well as ‘big-picture’ and visual imagery fall within the realm of the right-brain. The simplest things to do to build right-brain ability is anything artistic and spatial. So, play games, like Tetris, or Bejeweled. Put a jigsaw puzzle together, either in real life or on the computer screen. Draw some pictures. Color in an adult coloring book. Rhythm also falls in the right-brain sphere, so you can tap out a beat on the table, or drums. Listen to instrumental music, or, if it has words, let it be in a language you don’t understand. You can also dance, or rock back and forth, while you meditate – like shaman’s do to get into altered states. You could even rock in a rocking chair while you are meditating. I brought a line drawing to class and turned it upside down on a projector screen and had everyone draw it as best they could, most not being able to tell what it was. This really gets the right-brain involved, because if you can’t label what you are drawing, you’re purely looking at the lines and white spaces to draw it. I got this exercise from one of my art classes. It came from the book Drawing on the Right Side of the Brain by Betty Edwards. She believed that anyone could learn how to draw if they could cut off the input from the left-brain while drawing. After drawing the pictures my students immediately go into a meditation to reach alpha state, open and clear their chakras, ground their energy to the earth to insure a steady flow of energy running through them, and then go into their exercises to practice getting psychic information. It works very well. Once you get the feel for what that feels like, being in alpha and tapping into your right-brain, you will know how to ‘shift over’ into that state of mind. It just takes practice, like anything else. If you are working with a group of people to develop psychic ability, you can try a method where each person brings an item that they wore, or kept in their pocket for at least a day. This insures that the object has picked up energy imprints from the person. Have them place all the items on a tray and then have everyone pick up an item that isn’t theirs. Have everyone write down what comes to mind as they hold the object. This exercise isn’t so much for you to guess who’s it is, but more of a way to give a reading to the owner of the object (although there may be some correct guesses of who it belongs to). If there are just two of you, trade objects and read for each other. When you first begin reading, it’s common to get a bunch of stuff that makes no sense to you, but you need to say it out loud anyway, as this will probably make sense to the owner. One of the hardest things to overcome is the desire to censor yourself, because you think something sounds dumb. This is why it’s important to work with people you can let down your guard around. You need to just say whatever comes to your mind, not being afraid of looking foolish, or being wrong. This type of reading is what is called a ‘cold reading’ because a person is not asking a question and you are just going to relay anything that comes to mind. These are actually the hardest readings to do, because the information you get may not be on the subject that the person would have asked questions about. But since they are probably your friends or family and it’s free, they probably won’t be disappointed! Another way to connect with someone is to hold both of their hands as they sit across from you. You can close your eyes to concentrate and just say what comes to mind. If you’re in a group, have people trade partners, until everyone gets a reading from everyone else. When you’re reading your practice partners remotely, such as by Skype or phone, you can still tap into the energy of the person. It seems pretty amazing that this will work, but it does. Energy goes where attention is and if your full attention is on them, you will connect with them psychically and be able to read them. If you want to have them ask questions, go ahead and see what you get. Some psychics don’t use any form of oracle or psychic tool, other than what they interpret from psychic impressions they get. I like to use cards and runes and other forms of divination, as it gives my left-brain something to do, while my right-brain gets information.